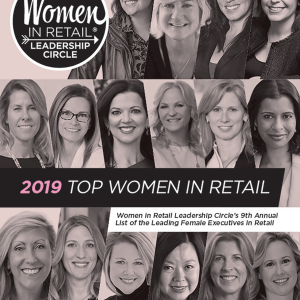 PHILADELPHIA, [March 20,2019] — Women in Retail Leadership Circle (WIRLC), a members-only association for enterprise-level women at top retailers and brands, is proud to announce the release of its ninth annual list of the leading female executives in retail. Honorees were chosen based on a number of criteria, including being in a top-level position within a retail organization, scope of responsibility within that position, career achievements, and involvement within the retail industry. This list serves as a resource to learn more about these retail leaders, from what characterizes their leadership style to whom they turn to for advice to the latest retail technology trends they’re tracking. It’s an introspective look at some of the brightest minds in the retail industry. These women will be honored at the Women in Retail Leadership Circle’s sixth annual Women in Retail Leadership Summit, taking place April 29-May 1 at the Ritz-Carlton Key Biscayne, Miami. The Summit will host 350-plus leading women retail executives for two-and-a-half days, with content focused on business strategy and executive professional development. The Top Women in Retail list, featuring exclusive interviews with all honorees, can be downloaded for free here. For more information about the Women in Retail Leadership Summit, visit www.womeninretailsummit.com. Women in Retail Leadership Circle (WIRLC) is a unique, members-only association that offers enterprise-level women in the retail industry a place to learn, connect and grow. Our community is comprised of successful, motivated and passionate women from the retail world. WIRLC strives to continuously offer members the opportunity to share best practices, discuss industry issues, and find inspiration on how to conquer challenges in their professional lives through virtual and live events, a weekly e-newsletter, an information-packed website, social media, and more. NAPCO Media, Women in Retail Leadership Circle’s parent company, has been a leading information source in the markets it serves since 1958. NAPCO Media continues to evolve with information distribution methods and specializes in the creation and cross-channel distribution of exceptional content. NAPCO Media’s mission is to build community between its audience and its clients. For more information, visit napco.com.